HONG KONG, 5 June, 2018 - Advanced Card Systems Ltd. (ACS), Asia Pacific's top supplier and one of the world's top 3 suppliers of PC-linked smart card readers (Source: Frost & Sullivan), will participate in Securing Federal Identity 2018. The event will be held on 5 to 6 June 2018, at the Hamilton Hotel in Washington DC, USA. 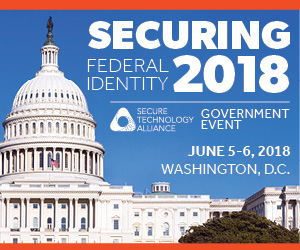 Securing Federal Identity 2018 is organized by Secure Technology Alliance. The conference will allow participants to understand and explore future federal government policies and technology developments of federal identity for both physical and logical access control. The event provides valuable learning, discussion and networking opportunities among suppliers, technological experts, government officials and other industry players. During the event, ACS will showcase mainly its new e-government readers. Besides the USB type C contact smart card readers - ACR39U-UF and ACR39U-NF, the Bluetooth® interface readers will also be displayed, including ACR3901U-S1 Secure Bluetooth® Contact Card Reader, ACR3901T-W1 Secure Bluetooth® SIM-sized Contact Card Reader and ACR1255U-J1 NFC Secure Bluetooth® NFC Reader. For more information on the event, visit www.securingfederalidentity.com. For more information on ACS products and solutions, email info@acs.com.hk or visit www.acs.com.hk. Advanced Card Systems Ltd. (ACS, a wholly owned subsidiary of HNA Technology Investments Holdings Limited, SEHK: 2086), founded in 1995, is Asia Pacific's top supplier and one of the world's top 3 suppliers of PC-linked smart card readers. ACS is the winner of the Product Quality Leadership Award for Smart Card Readers from Frost & Sullivan. In 2010, 2014, and 2015, ACS was listed in Forbes Asia's “Best Under a Billion", an inter-industry list comprised of 200 top-performing publicly listed companies in the Asia-Pacific, with sales between US$5 million and US$1 billion. ACS develops a wide range of high quality smart card reading/writing devices, smart cards and related products and distributes them to over 100 countries worldwide. Visit ACS at http://www.acs.com.hk/.